This quilt is 61.5" w x 68.5" h. An original design, pieced and raw-edge appliquéd. 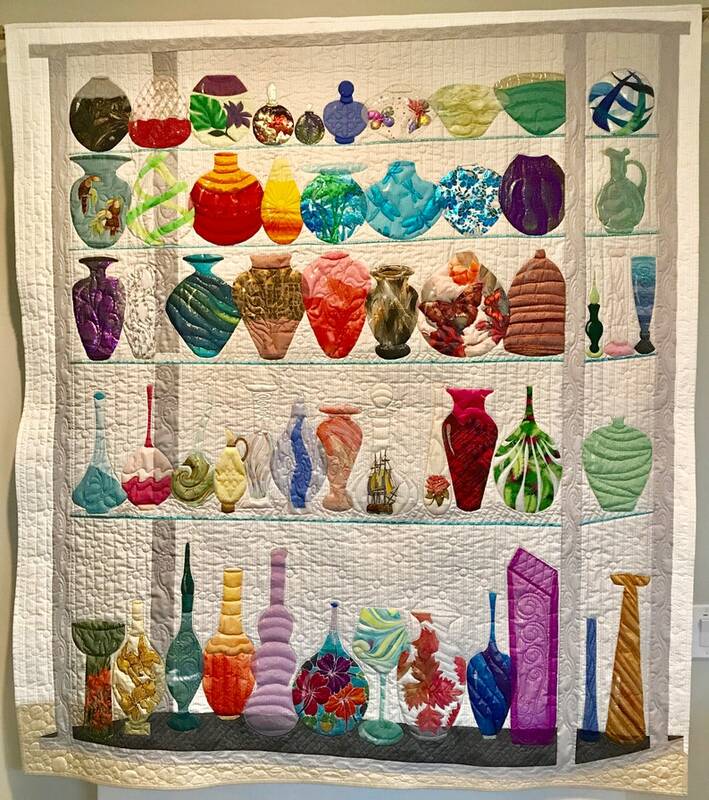 My goal was to make a fabric quilt look like glass. The cabinet is 100% cotton fabrics. The glass pieces are many different fabrics including satin, shiny & glitter tulle, organza, crinkle sheers, metallics, and more. Nylon tulle covers the raw-edge appliqués. Longarm quilted, computerized and hand guided with Poly, Cotton, MonoPoly, and Metallic threads. Hobbs silk batting for trapunto and overall. There are 3 small spots where the tulle has patched holes (lower left corner), see photo (the largest is 1/2" x 3/8"). There is a sleeve on the top of the back for hanging on a dowel or curtain rod. Want to do this for my son-in-law. It came quickly. emailed Karen about fabric. She suggested sites to find it, but it is difficult. I have found some but not all. It will be a while before I do it. I will have to travel wide and far to find what I need. The internet (many) sites I looked at have given me only some. Arrived very quickly! Pattern is great. Very detailed and precise instructions! I cannot wait to get started!